Children with frequent ear infections many times may have upper cervical subluxations. By adjusting these children we are able to decrease the number of yearly ear infections, preventing unnecessary medications or even surgery! Chiropractic care can be very beneficial in maintaining a healthy nervous system in children. Ask any new mom if their labor and delivery was easy and I’m sure there will be a definitive “no!” Giving birth is hard, on mommy and baby. Did you know that 95% of infants have subluxations in the spine after birth? Have you ever watched a toddler walk around? What do they do more than anything else? Fall! 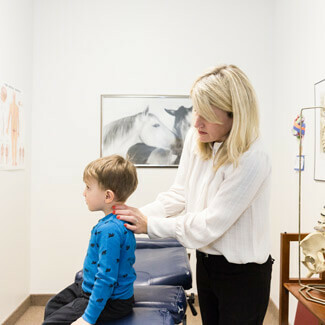 At Barone Family Chiropractic, our patients bring their children in routinely for spinal checkups and subluxations on little ones we find usually take one to two treatments to completely resolve. The treatment we give children is very gentle, many times just using the pressure from our pinky to resolve an issue. Our doctors love our pregnant patients and they love us! We work in conjunction with our patients’ midwives and obstetricians to maintain the optimal pelvic and lumbar biomechanics so that baby has the ability to move into a position for a healthy labor and delivery. We also utilize the Weber technique to gently guide the baby head down while in a breech position. Chiropractic care is also beneficial to pregnant women as a drug free approach to pain. Pregnant moms love our special adjusting table and cushion that allows them to lay on their tummies while we gently and carefully give them the care they need. Contact us to get started and discover the benefits of chiropractic for children and pregnancy!